The 61st year of the Dance Magazine Awards represents a major step forward. It extends the reach of the awards and now marks the second year of our collaboration with the Harkness Foundation for Dance, thus uniting two iconic organizations. Firstly, this will be the inaugural presentation of the Harkness Promise Awards, which recognizes new talent at the upswing of their careers. Nurturing emerging artists, especially choreographers, is critical to ensuring dance's role in today's cultural landscape. Some nights, you head home buzzing with energy. After last night's Dance Magazine Awards, we were dancing with it. We had the privilege of honoring four legends of our field—Rennie Harris, Marika Molnar, Linda Celeste Sims and Diana Vishneva—in a ceremony that was filled with inspiration and beauty. What do Fred Astaire, Pina Bausch and Misty Copeland have in common? They are all part of one of the most prestigious groups in dance: the Dance Magazine Award recipients. A tradition that dates back to 1954, the Dance Magazine Awards celebrate the living legends who have made a lasting impact on our field. 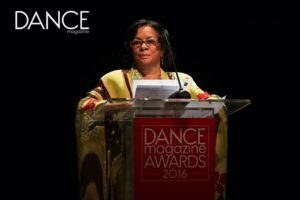 At the end of the Dance Magazine Awards last night, editor at large Wendy Perron summed up the event perfectly: "I feel so nourished," she said. Tiler Peck in Balanchine's "Fascinatin' Rhythm." PC Christopher Duggan. It was an exceptionally moving evening filled with heartfelt dances and profoundly honest speeches. What a treat it was to see awardee Tiler Peck perform "Fascinatin' Rhythm" from George Balanchine's Who Cares? up close where all the details of her musicality, breath and cheeky personality were right in front of us. 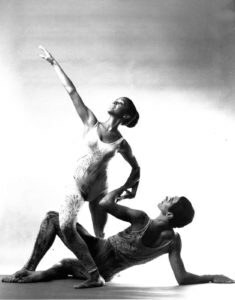 And to watch Alvin Ailey American Dance Theater's Elisa Clark dance Robert Battle's touching 2010 solo For Carolyn, in honor of his mentor, awardee Carolyn Adams. And for awardee Lar Lubovitch to offer a sneak peek of what he's working on in preparation for his next work. Robert Battle introduced Carolyn Adams by describing how, as a student, he would "wait like a baby bird for a gem" of wisdom from her. One of his favorite insights? "As you walk up to a door, part of you already sees yourself on the other side," Adams would tell her students. "Even when this job gets tough," Battle continued, "I see the other side, and there is Carolyn, dancing in the light." Carolyn Adams. PC Christopher Duggan. 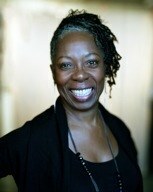 Upon accepting her award, Adams spoke about how she believed dance was our birth right, and how, with the help of people like Paul Taylor, she'd dedicated her life to sharing it. Damian Woetzel presenting to Tiler Peck. PC Christopher Duggan. 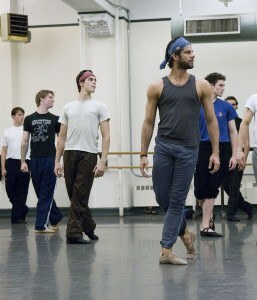 Damian Woetzel then told us the story of the first time he saw Tiler Peck dance: While warming up in the wings, he spotted a new corps member with a jazzy, nuanced musicality he couldn't take his eyes off of. Today, he and his wife Heather Watts jokingly call Peck "the magical unicorn princess" because of her exceptional talents. A humbled Peck took the stage, admitting that she felt like she hadn't accomplished enough yet in her career to receive such a prestigious honor. But then she realized it was the perfect moment to celebrate her 10 years at New York City Ballet, and get inspired for many more to come. 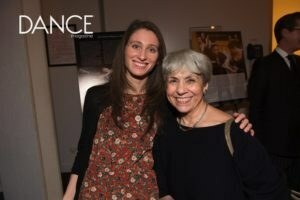 Lynn Garafola with Dance Magazine writer Siobhan Burke. PC Christopher Duggan. To introduce awardee Lynn Garafola, writer Elizabeth Kendall posed the question, "Why does dance, an ephemeral art form, need a history?" She answered the question brilliantly, noting that what happened before creates what happens now. Garafola is not only a master of documenting what happened before (she has written or edited 10—soon to be 11—books), but also incredibly generous in helping anyone else trying to do the same. Lar Lubovitch. PC Christopher Duggan. "I like to think that I bring back performances and dancers for a new community," said Garafola, who was celebrating her 70th birthday. She spoke about features she'd written for Dance Magazine, from "Price-Tagging Diaghilev" to an interview with Maya Plisetskaya. Closing out the night was Martha Graham Dance Company artistic director Janet Eilber presenting to Lar Lubovitch. 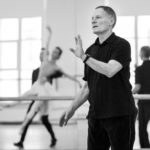 She shared how, when she asked his advice for young choreographers, Lubovitch said, "Don't chase the newest trend," admitting that he's been in and out, in and out, in and out of style over the course of his career, yet always remained true to his vision. 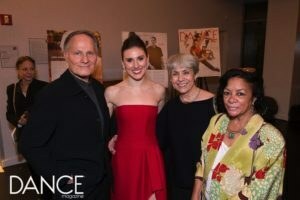 Awardees Lar Lubovitch, Tiler Peck, Lynn Garafola and Carolyn Adams. PC Christopher Duggan. For his part, Lubovitch told the quirky story of the first time he ever felt compelled to dance: Around age 3 or 4, the dime store across the street from his family's apartment caught fire, and the next morning, the water the firefighters had sprayed froze with the toys trapped inside, including a teddy bear. Without thinking, Lubovitch felt compelled to move: "Our bodies take over when something inexpressible happens." He spoke about the many reasons people have danced throughout history—from warriors to Salome and Mata Hari to Louis XIV. "Through the drama of line, shape and motion, we can say what is most truthful, and therefore most beautiful," he stated, adding that all of his work might be an attempt to recapture that moment of staring at the frozen teddy bear. He confessed that, as a lifelong "Trekkie," he's inspired by Captain Kirk's mission statement: "To boldly go where no one has gone before." We congratulate all of the awardees, and can't wait to see where else they will boldly bring dance in the years to come. Is there any better treat than getting to honor the greats among us? Since 1954, the Dance Magazine Awards have celebrated dozens of dance artists who've made outstanding contributions to our field. This year is no different. We are delighted to announce that the 2016 Dance Magazine Awards will go to choreographer Lar Lubovitch, New York City Ballet principal Tiler Peck, modern dance icon and advocate Carolyn Adams and dance historian Lynn Garafola. Keep your eye out for our December issue to learn more about the incredible impact each has made. Join us to honor these legends at a ceremony on December 12 at New York Live Arts. Expect special performances, celebrity guests and heartfelt speeches. Alvin Ailey American Dance Theater artistic director (and master speech-maker) Robert Battle will be there to present the award to his long-time mentor Carolyn Adams. Dance writer Elizabeth Kendall will introduce her colleague Lynn Garafola. Martha Graham Dance Company artistic director Janet Eilber will give choreographer Lar Lubovitch his award. And Vail International Dance Festival director Damian Woetzel will help us celebrate his former partner, Tiler Peck. It's sure to be a night you won't forget. For tickets, email dmawards@dancemedia.com or call 212-979-4872. A soulful flamenco idol, a princely partner, a determined leader, a beloved scholar, a boundary-breaking choreographer. This year, Dance Magazine honors five dance luminaries who have pushed our field forward and made dance an even richer art form. We are delighted to present 2015 Dance Magazine Awards to flamenco star Soledad Barrio, American Ballet Theatre principal Marcelo Gomes, National Ballet of Canada artistic director Karen Kain, dance historian and archivist David Vaughan and Urban Bush Women founder Jawole Willa Jo Zollar. The ceremony to celebrate these amazing dance artists will take place December 7 at 7:30 pm at The Ailey Citigroup Theater in New York. 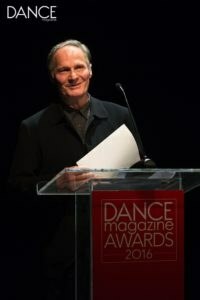 As The New York Times has put it, “As far as dance celebrities are concerned, the annual Dance Magazine Awards is as close as they come to a star-studded event.” Mikhail Baryshnikov will present the award to Kain; Millicent Johnnie to Zollar, Julie Kent to Gomes, Martín Santangelo to Barrio and Valda Setterfield to Vaughan. Members of Urban Bush Women and ABT will dance in tribute to these honorees, and Barrio will perform along with live flamenco musicians. Tickets are available for $50. To purchase, contact Nicole Buggé at 212-979-4872 or dmawards@dancemedia.com. Clockwise from top left: Photo by Chris Bennion, courtesy Noche Flamenca; Karolina Kuras, courtesy NBoC; Crush Boone, courtesy UBW; Gene Schiavone, courtesy ABT; Gilbert Gaytan. In 2017, we celebrate Rennie Harris, Marika Molnar, Linda Celeste Sims and Diana Vishneva. Join us to celebrate with live performances and special guests at New York's Ailey Citigroup Theater on December 4. For the first time, this year's event will donate proceeds to the Harkness Foundation for Dance to fund a newly-created award for choreographers in their first decade of professional work. Click here for the official press release. Tickets to the performance and post-awards cocktail party are $250. Opportunities to participate at a leadership level of $1,000 are available and include a VIP pre-performance champagne reception. Performance-only tickets are $50. To order, email dmawards@dancemedia.com or call 212-979-4872.